Funko Pop! Captain Marvel. Glow in the Dark. Target Exclusive. New in the box Funko Marvel Captain Marvel #433 Bobble-head Glow in the dark Target exclusive. Captain Marvel (2019) - Captain Marvel Masked Flight Glow Pop! This way we know that you have received your item. Bendigo Bank. Account Number: 148404890. BSB: 633000. 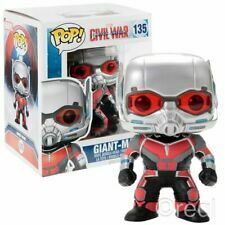 Captain Marvel # 446 Exclusive Marvel Collector Corps Pop Vinyl Figure by Funko. Condition is New. Also would like to note that the bottom of this box came with small damage as you can see in the last picture. 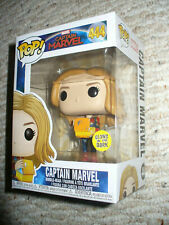 Great pop to complete your captain marvel collection! MANUFACTURER: FUNKO. ITEM: CAPTAIN MARVEL. GENRE: MARVEL. MADE FROM: VINYL. Captain Marvel is amazing, but she’s accompanied by an incredible cast of allies and This Pop! Marvel: Captain Marvel series features; Captain Marvel, Goose the Cat, Maria Rambeau, Nick Fury, Star Commander, Talos, and Vers. This Maria Rambeau bobble-head stands approximately 3 ¾ inches tall and is packaged inside a window display box. Recommended Minimum Age: 3 years - small parts not suitable for children under 36 months. Captain Marvel # 446. Pop Vinyl by Funk. New in box. Never been opened. FUNKO POP! Title: FUNKO POP! MARVEL: Captain Marvel - Goose the Cat. Hop a ride with Carol Danvers on an adventure to save the world, with this Pop! Rides bobble-head. Carol Danvers stands approximately 6 inches tall and comes packaged in a window display box. Recommended Minimum Age: 3 years - not suitable for children under 3 years. Complete your set by assembling the entire team and the rare holographic chase versions of certain characters! You may receive duplicates. Funko POP! Funko Pop! Vinyl Marvel Captain Marvel. Captain Marvel from the hit movie Captain Marvel, as portrayed by Brie Larson. Based in the Hills District, Sydney. OZ Pop Culture. © 2019 OZ Pop Culture. There is no limit to our range and we are always looking to add that new and exciting thing that everyone wants! Captain Marvel - Goose the Cat Pop! Pop Pop Vinyl-Standard size. Pop Pop Vinyl-Supersize. Many DVD players can be made multi region compatible quite easily. To check if a DVD or Blu ray with a region code other than your own will play on your player, try checking the following link and put your make and model of player in the search box. Funko POP! Character: Captain Marvel with Lunchbox. Earth is caught in the middle of a galactic war between two alien races and Captain Marvel may be the only hope! This Captain Marvel Holding Lunchbox Pop! Captain Marvel is amazing, but she’s accompanied by an incredible cast of allies and This Pop! Marvel: Captain Marvel series features; Captain Marvel, Goose the Cat, Maria Rambeau, Nick Fury, Star Commander, Talos, and Vers. This Vers bobble-head stands approximately 3 ¾ inches tall and is packaged inside a window display box. Recommended Minimum Age: 3 years - small parts not suitable for children under 36 months. Captain Marvel (2019) - Carol Danvers Pop! This way we know that you have received your item. Account Number: 148404890. Trending at C $21.36eBay determines this price through a machine-learned model of the product's sale prices within the last 90 days. 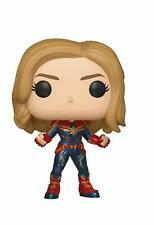 From Captain Marvel, Captain Marvel, as a stylized POP vinyl from Funko! It's a cat not Hannibal Lector. Add a truly special pop to your collection whether you're a fan of the new Captain Marvel or not. This Captain Marvel Goose the Flerkin Glow in the Dark Pop Vinyl features the ginger cat Goose adopting her Flerkin tentacle filled form and swallowing the Tesseract. Bring the Starforce to your favorite pen with Captain Marvel and Goose the Cat pens from Funko! Each pen measures approximately 6 ½ inches and features an adorable character resting atop it. Pens write in black ink. ✷ Listing is for only one (1) pen. Pens are selected at random - we cannot accept requests of a specific character ✷ Recommended Minimum Age: 3 years - small parts not for children under 3 years. Captain Marvel (2019) - Captain Marvel Pop! This way we know that you have received your item. Account Number: 148404890. Funko Pop! Product Details. UPC 889698375856. Manufacturer # 37585. Funko Pop Captain Marvel Masked Glow # 432 Captain Marvel. New Funko Pop CAPTAIN MARVEL GLOW IN THE DARK Target Exclusive #433 IN HAND 2019. Condition is New. Shipped with USPS Priority Mail. From Avengers, Captain Marvel, as a stylized POP vinyl from Funko! Captain Marvel (2019) - Goose the Cat Flocked Pop! This way we know that you have received your item. Account Number: 148404890. FUNKO POP! Title: FUNKO POP! MARVEL: Captain Marvel - Vers. New Glow in the Dark Captain Marvel Target Exclusive Funko Pop! Great condition ! Captain Marvel - Goose the Cat Pop! Vinyl - FunKo Free Shipping! Captain Marvel - Goose the Cat Pop! Earth is caught in the middle of a galactic war between two alien races and Captain Marvel may be the only hope! Marvel series #426. At The Nile, if you're looking for it, we've got it. Funko Pop! Marvel Captain Marvel Movie Captain Marvel 4 inch vinyl figure NEW! Funko Pop! From Captain Marvel, Captain Marvel (styles may vary), as a stylized POP vinyl from Funko! Collect and display all Captain Marvel pop! We are grateful for your interest in Batcave Treasures! Funko Pop Goose the Cat Flocked # 426 Captain Marvel. Captain Marvel - Goose the Cat Flocked US Exclusive Pop! Vinyl [RS]-FUN36606. Pop Pop Vinyl-Standard size. Pop Pop Vinyl-Supersize. Many DVD players can be made multi region compatible quite easily. Captain Marvel - Goose the Cat Flocked Pop! Vinyl - FunKo Free Shipping! Captain Marvel - Goose the Cat Flocked Pop! Earth is caught in the middle of a galactic war between two alien races and Captain Marvel may be the only hope! Marvel series #426. At The Nile, if you're looking for it, we've got it. Captain Marvel is amazing, but she’s accompanied by an incredible cast of allies and This Pop! Marvel: Captain Marvel series features; Captain Marvel, Goose the Cat, Maria Rambeau, Nick Fury, Star Commander, Talos, and Vers. This Yon-Rogg bobble-head stands approximately 3 ¾ inches tall and is packaged inside a window display box. Recommended Minimum Age: 3 years - small parts not suitable for children under 36 months. FUNKO POCKET POP KEYCHAIN!!! MARVEL CAPTAIN MARVEL!!!!! FUNKO POCKET POP KEYCHAIN!!! MARVEL CAPTAIN MARVEL!!!!!. Condition is Brand New, never opened! Shipped with USPS First Class Package. Pop Pop Vinyl-Standard size. Pop Pop Vinyl-Supersize. Many DVD players can be made multi region compatible quite easily. To check if a DVD or Blu ray with a region code other than your own will play on your player, try checking the following link and put your make and model of player in the search box. Funko Pop Captain Marvel Glow Hands # 432 Captain Marvel. FUNKO POP! Title: FUNKO POP! MARVEL: Captain Marvel - Maria Rambeau. Give your keys a marvelous touch with Captain Marvel and Goose the Cat vinyl keychains! Captain Marvel and Goose the Cat are great accessories to show off your superpowers! Captain Marvel stands approximately 1 ½ inches tall and is packaged in a window display box. ✷ Metal keyring is included ✷ Recommended Minimum Age: 3 years - small parts not suitable for children under 36 months.